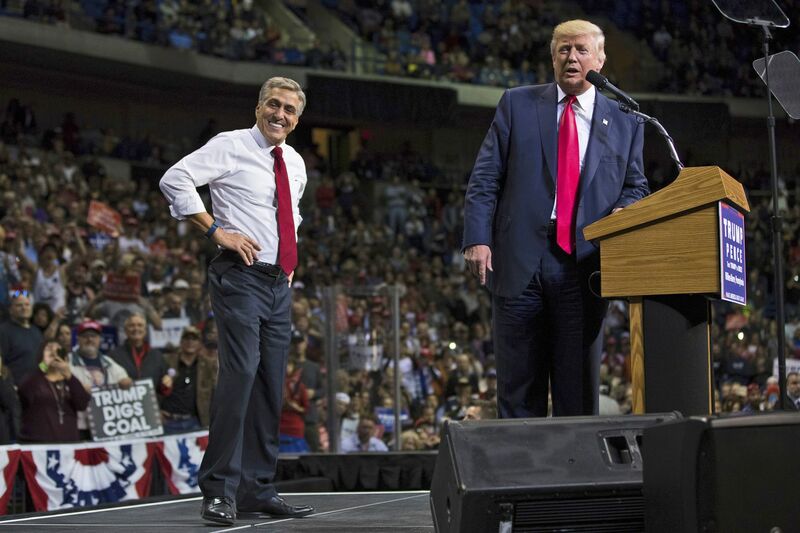 President Trump will headline a campaign rally for Republican U.S. Rep. Lou Barletta in Wilkes-Barre next week, the second half of a one-two political punch after Vice President Pence stumped Monday in Philadelphia to boost Barletta's bid for the Senate. Trump's campaign website on Wednesday started accepting reservations for next Thursday's rally at the Mohegan Sun Arena at Casey Plaza. Trump held campaign rallies at the 10,000-seat stadium in April and October 2016 for his presidential campaign. The event was first reported by the Wilkes-Barre Times Leader and the Scranton Times-Tribune. Barletta, who served as cochairman of Trump's 2016 campaign in Pennsylvania, has said it was Trump in June 2017 who first urged him to challenge Democratic U.S. Sen. Bob Casey's bid for a third term. He said Wednesday that "next Thursday, voters will hear the truth from President Trump that Bob Casey obstructing tax cuts and blocking well-qualified judicial nominees is hurting Pennsylvania workers and families." The presidential visit comes as Republicans in both Pennsylvania and Washington have grown pessimistic about Barletta's challenge – dismayed by his soft fund-raising and a concern that he is relying too heavily on trying to re-create Trump's coalition. Public polls have shown Casey with a double-digit lead in the race, and the Democrat has a massive edge in campaign funds, with nearly $10 million on hand as of June 30, compared with about $1.56 million for the challenger. Barletta is hoping the president's personal involvement and outside political spending groups will help carry his campaign, but those kind of organizations will want to see progress before investing in the race. And conservative groups have many options to choose from, since 10 Democratic senators are seeking reelection in states Trump won. When Senate Majority Leader Mitch McConnell in May listed nine races that he thought would be key to control of the Senate, Pennsylvania's contest wasn't among them. "Lou Barletta has not yet shown this is a viable pickup opportunity, but perhaps President Trump's visit can help jump-start that effort," said a Washington Republican operative tracking Senate races. Trump has a fondness for Pennsylvania and Barletta. He went to college at the University of Pennsylvania, scored one of his biggest Election Day upsets in the Keystone State, and has continued to return regularly for campaign events and rallies. Barletta, a longtime hard-liner on illegal immigration, was one of the first elected Republicans to support Trump, and the president values personal loyalty. Though his support is thin in Southeastern Pennsylvania, Trump remains popular in many other parts of the state. Republicans believe the polls will narrow if they can boost Barletta's name recognition, particularly in places like the Northeast. Luzerne County, where Wilkes-Barre sits, was one of three statewide that turned red for the 2016 election and helped Republicans end a three-decade drought here in presidential elections. Trump appeared at the Mohegan Sun Arena on Oct. 10, 2016, three days after his presidential campaign was rocked by the public release of the Access Hollywood video that included graphic audio of the candidate boasting about sexually assaulting women and getting away with it because of his fame. Barletta initially called Trump's comments "indefensible, demeaning, and totally inappropriate." But he was on stage with the candidate at the October rally, as Trump railed about illegal immigration, trade deals, taxes, the media, and Democratic nominee Hillary Clinton. Trump also praised the group WikiLeaks, which had just released emails describing a speech Clinton had delivered to Wall Street banks.